Cello In A Box: In This Case, Smaller Is Better What to do when you want to take your cello with you, but you haven't got the space? Ernest Nussbaum has the answer: Prakticello. His streamlined practice instruments fold up into a surprisingly small, portable box. 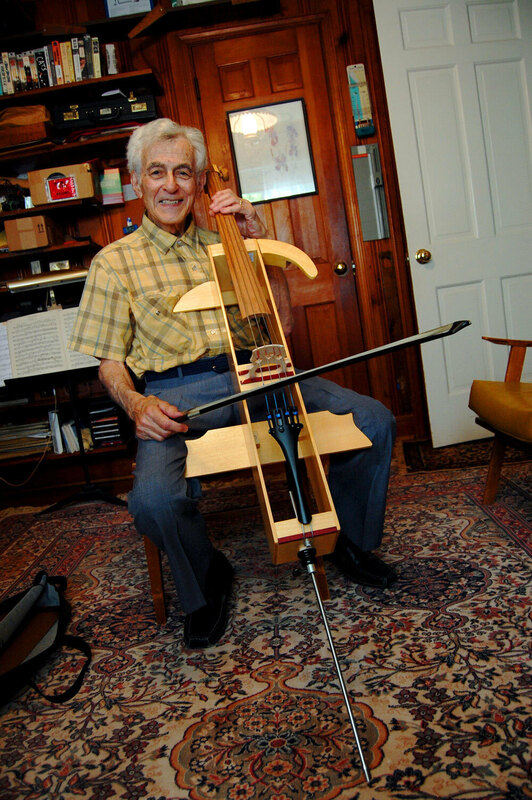 Ernest Nussbaum has been building practice cellos since the early 1980s. Janet Frank of the National Symphony Orchestra and Sheri Greening of the Lake Charles Symphony demonstrate the Prakticello. Three decades ago, Ernest Nussbaum had an idea: What if you had a cello that you could take apart, pack into a small box and take on vacation? 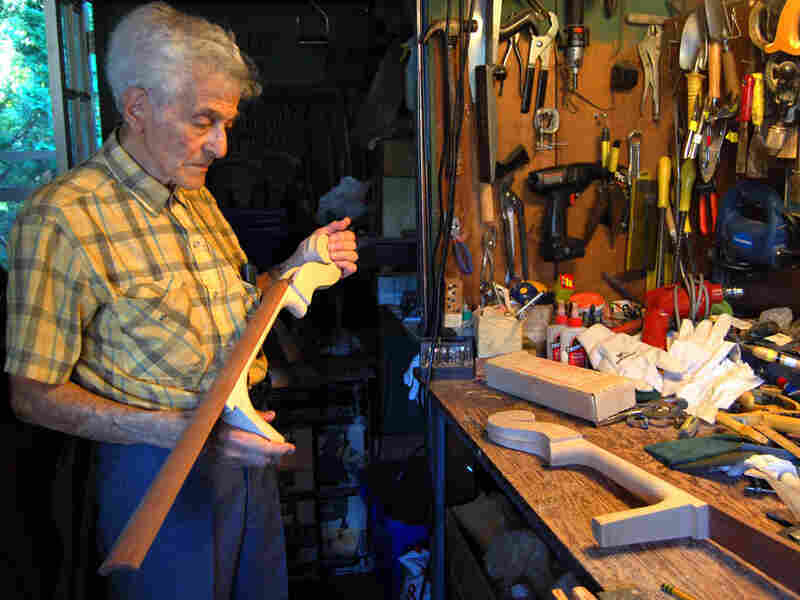 That was the beginning of the "Prakticello," an instrument Nussbaum, now 82, still makes in his Bethesda, Md., garage. 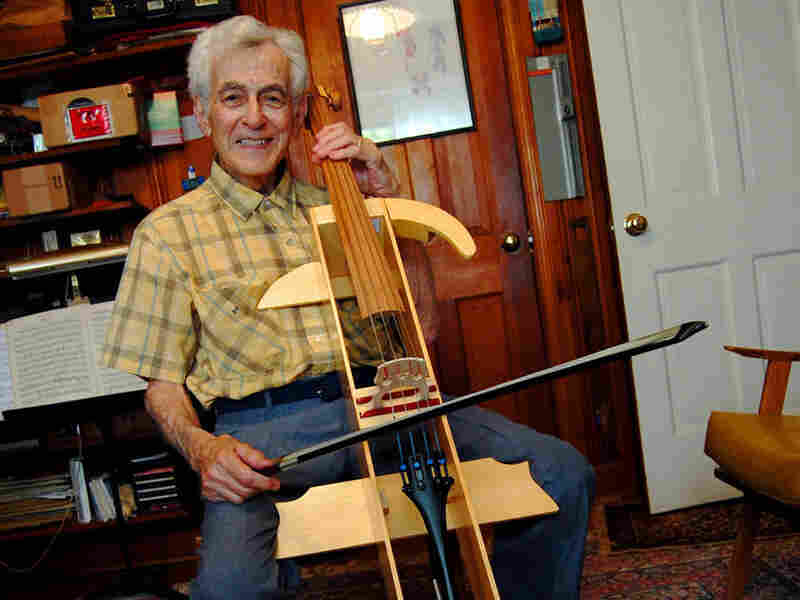 An amateur cellist and a civil engineer by training, Nussbaum began in the early 1980s with his own regular cello; he placed it on brown packing paper and traced out the areas that actually touch the body. From there, he designed two wooden boards that rest against the chest and knees, and then a long, rectangular frame to serve as the instrument's body. He found he could source the neck, fingerboard, tailpiece, bridge and strings from suppliers and adapt them as necessary. Assembled, the Prakticello looks like something Picasso would have painted in his Cubist period. All of the pieces fit inside the body, which measures just 30 inches long. It's tiny when compared to a regular cello, and small enough to put in the overhead compartment of most planes. Nussbaum says he's not the first to make such a thing, but that he may be the one who has stuck with it the longest. Currently, Yamaha offers an electric practice cello. Nussbaum's Prakticello sounds quieter and thinner than a regular cello. There's no sound post, and no real body for the sound to resonate through, but it's quite audible. "People are usually pleased at the tone quality," Nussbaum says, "because they expect it to sound horrible, and they find it doesn't sound horrible, so that's good." While it's not something she would play in public, National Symphony Orchestra cellist Janet Frank says it's great for practicing. "You can learn a piece of music. You can practice scales. You can practice arpeggios. You can do everything you need to do when you're practicing the cello," Frank says, adding that it's been especially useful on international trips, when she is often without access to her regular cello for one or two days at a time. Since the early 1980s, Nussbaum has sold about 450 Prakticellos to amateurs and professionals. Other buyers include Joel Krosnick of the Juilliard String Quartet and Yo-Yo Ma. Two years ago, Sheri Greening of Louisiana's Lake Charles Symphony discovered Nussbaum's website after doing an Internet search for "travel cello." This spring, she took her Prakticello on a snorkeling trip to Honduras. "I took this thing down to this little hut on stilts, and I practiced every afternoon. I probably played about three hours a day," says Greening, who had a wedding to prepare for. Nussbaum says he pours about 40 hours of labor into each instrument. He makes three at a time. Nowadays, they sell for $1,275; the materials alone cost nearly half that. "It's an up-and-down business," Nussbaum says. "For two months, I'll hear from nobody and go around moaning and groaning that the business has come to an end. Then I'll get three orders within a week or 10 days." Nussbaum says it's plenty to keep him busy, but not so busy that he can't pursue his main hobby: playing chamber music on his regular cello with friends.